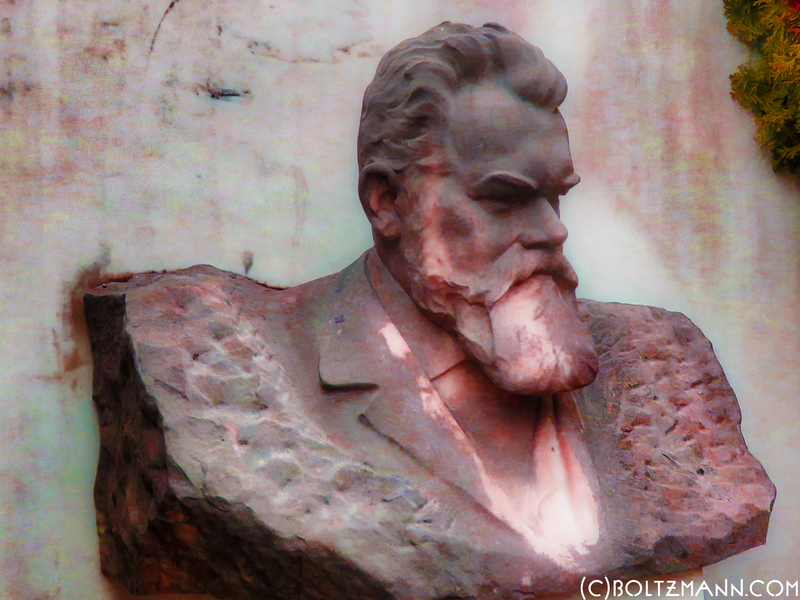 news - Page 5 of 5 - Ludwig Boltzmann. 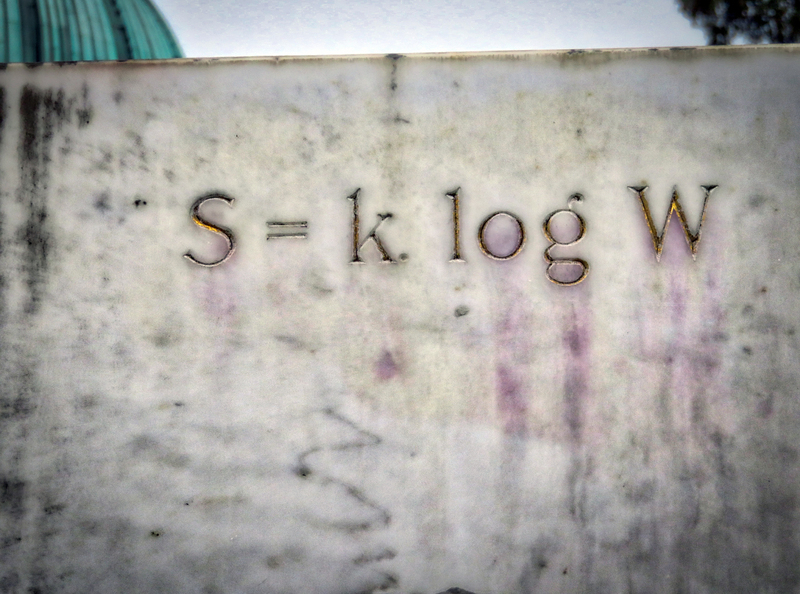 Measure information. 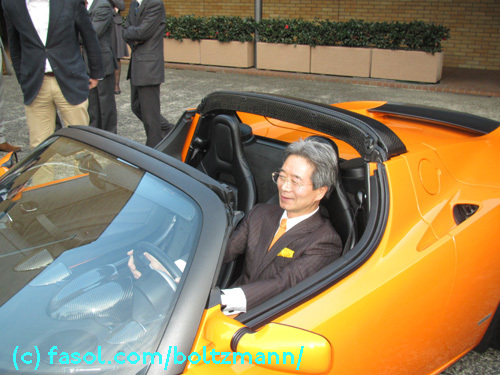 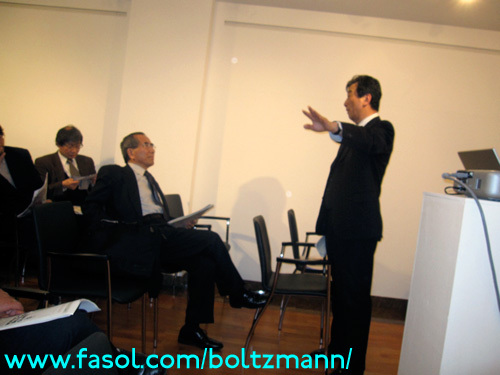 Tatsuo Masuda described how Japan’s energy strategy and policy was until recently determined more or less behind closed doors by a group of about 100 insiders, of which Tatsuo Masuda has been one. 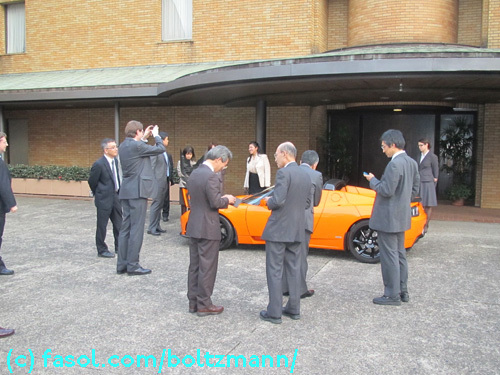 This situation could continue as long as nothing went wrong. 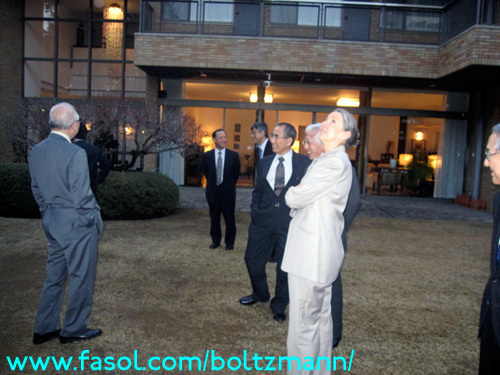 Atomic energy was introduced to Japan via the USA, and instead of growing nuclear technology over an extended period of time within Japan, policians decided on a very short time schedule, which made it impossible to develop nuclear technology within Japan, and left purchase of ready-made nuclear power-plants and adoption of nuclear power technology from the USA as the only option. 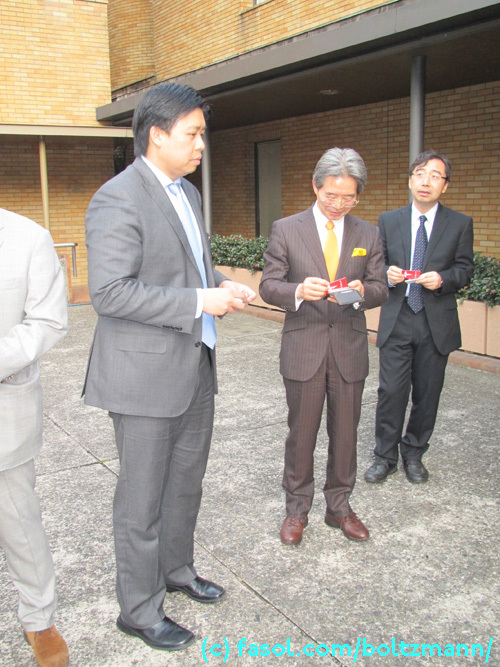 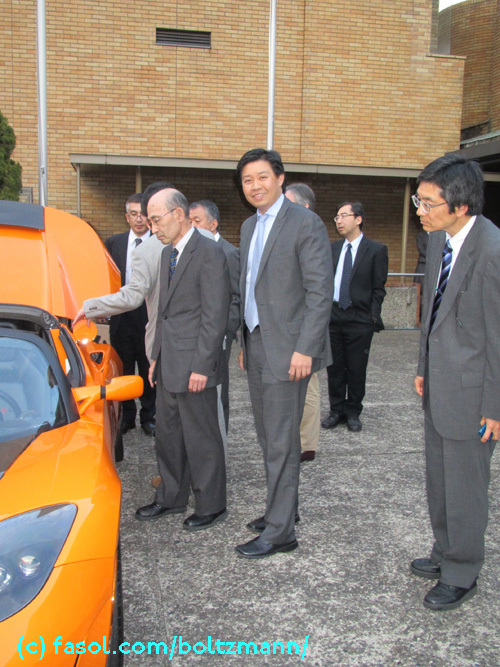 Tatsuo Masuda predicts the “democratization” of electrical power generation in Japan. 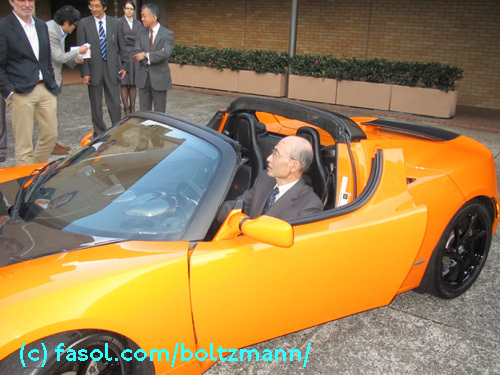 While at present almost all electrical power in Japan is produced by regional monopoly companies, in the future a development is likely, where many organizations, corporations, and private citizens will take part, or even may take over the main task or producing electrical energy in Japan. 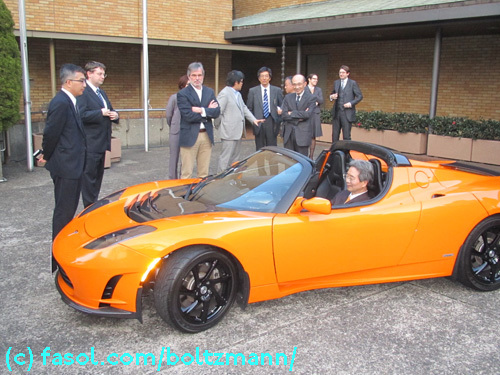 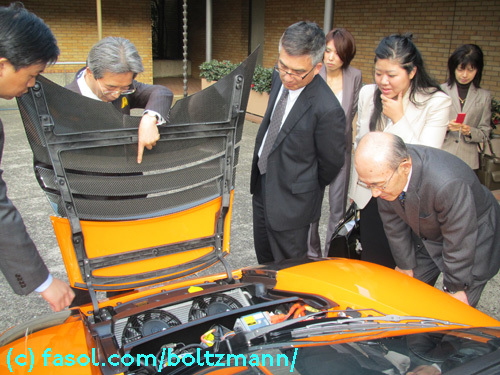 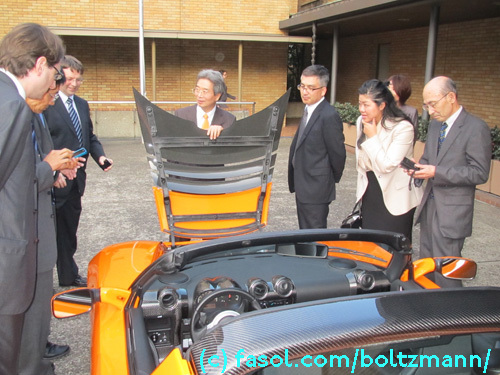 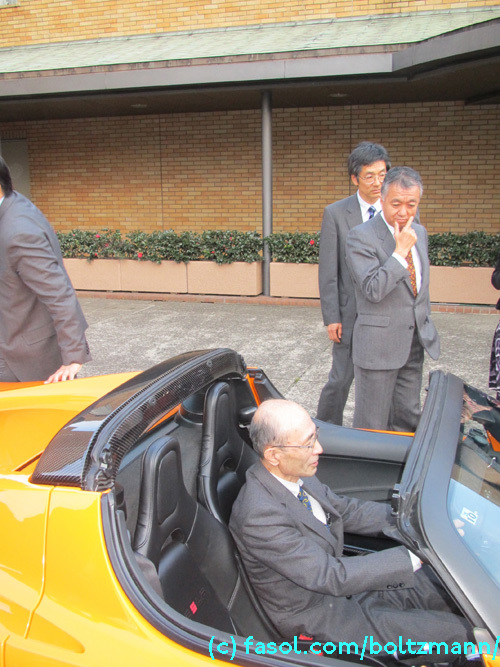 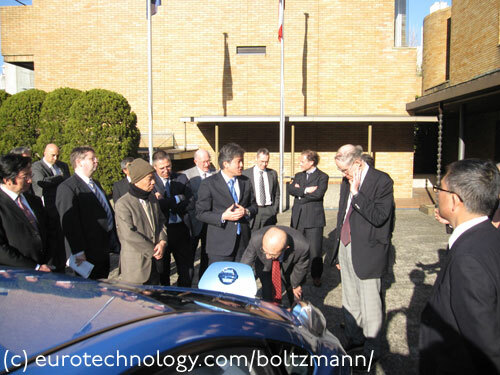 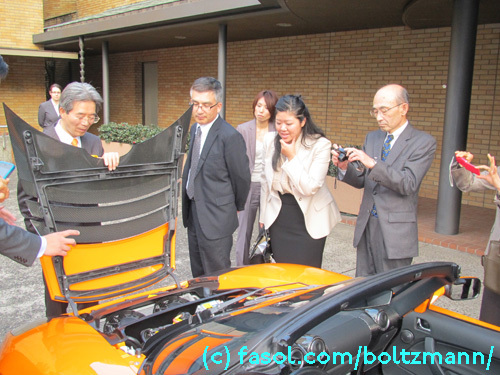 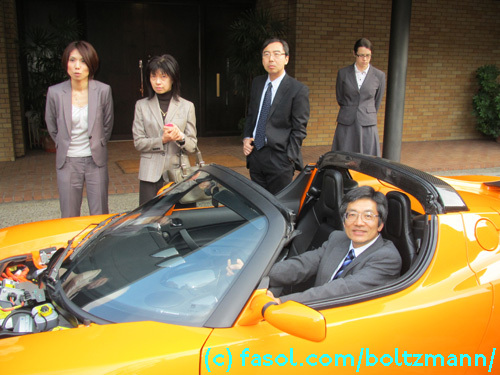 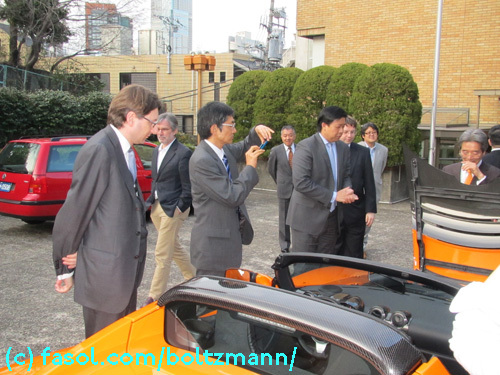 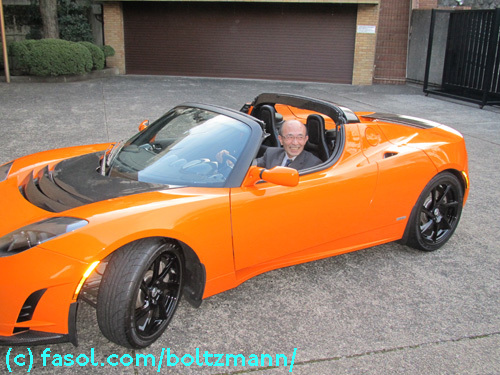 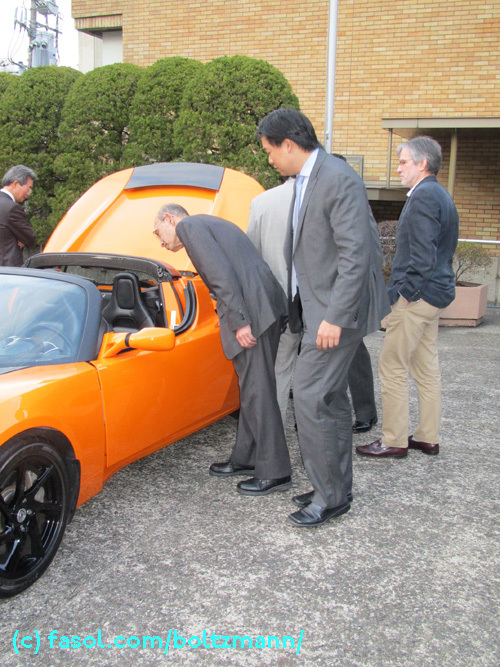 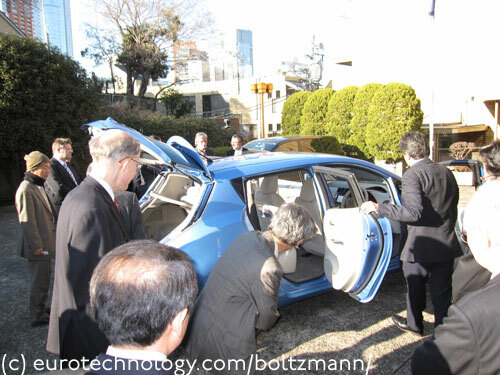 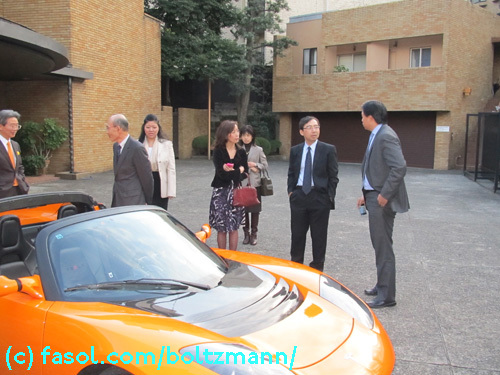 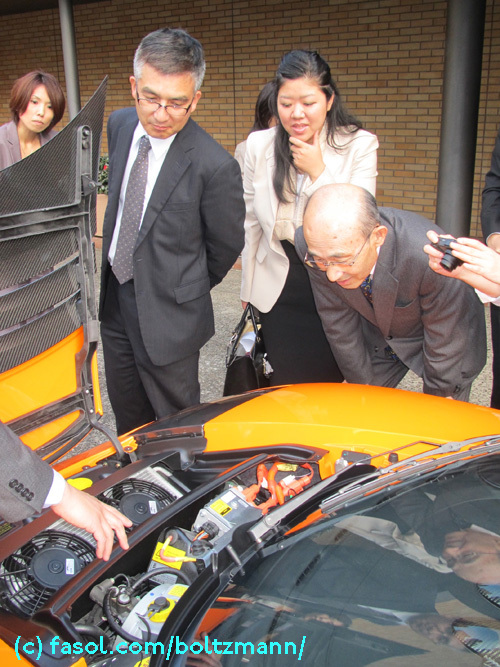 Mr Watanabe explained that the Leaf electric car is the center of an energy management system, where the battery of Leaf electric car is an integral part of the energy management of the owner’s household. 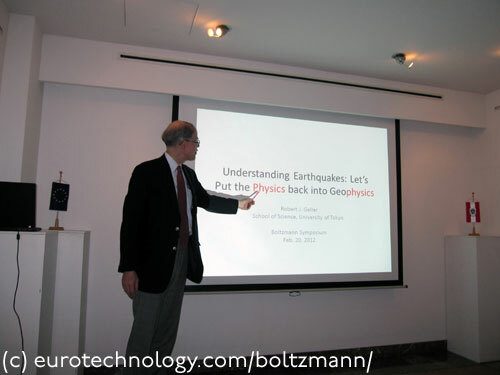 Robert Geller calls for an return to the principles of physics in understanding earth quakes and in preparing for future disasters, instead of following positions based on political or funding priorities. 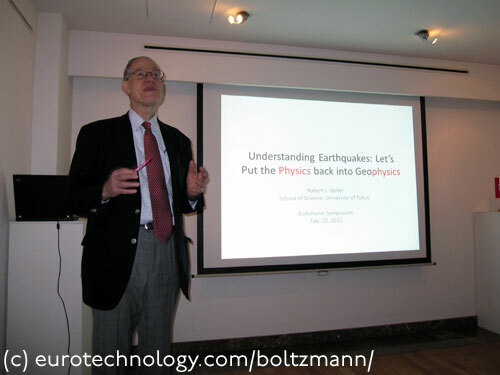 Robert Geller for a long time has been arguing for the view, that the timing, location and strength of earthquakes cannot be predicted due to fundamental principles of physics, and the nature of the earth. 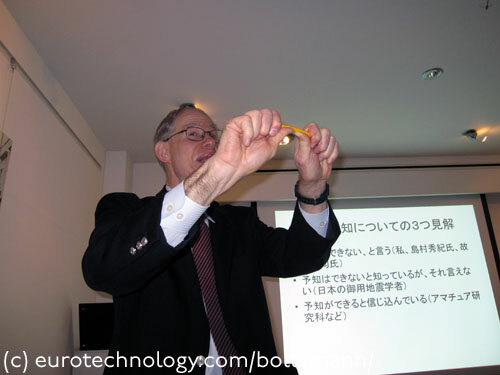 Robert demonstrated his arguments by bending a pencil in front of us (see photos below). 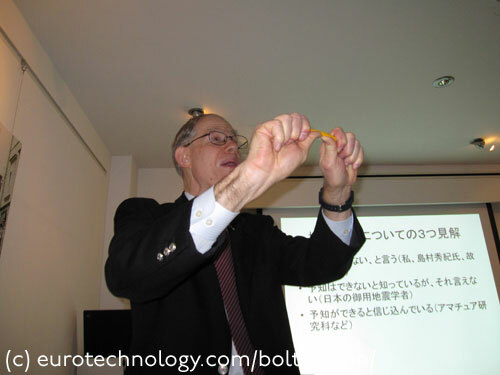 While the stress distribution and other details can be calculated with precision, it is not possible to predict the time and the way the pencil breaks with accuracy. 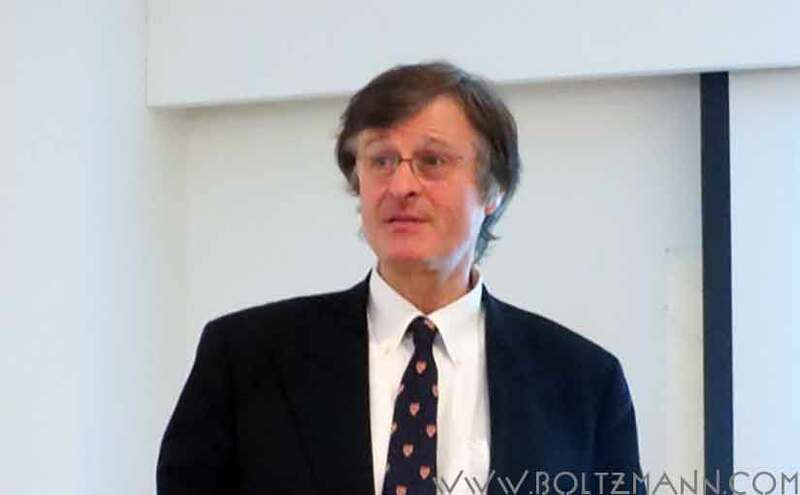 Robert argues that in a similar way, earth quakes can also not be predicted, because earth quakes are essentially in the mathematical sense chaotic phenomena. 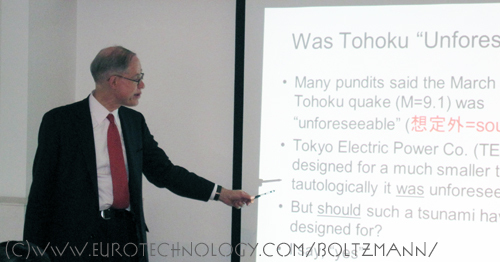 Robert explained how a group of earth scientists years ago promised that they could predict earth quakes with the purpose of obtaining politically motivated funding for their research. 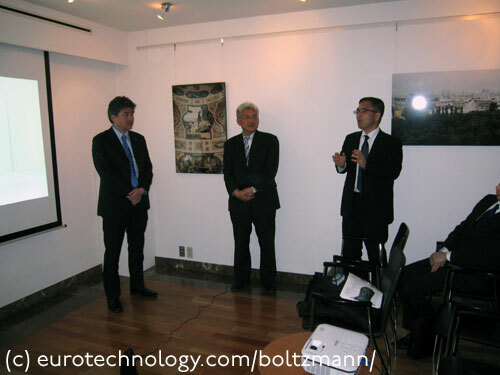 They were successful in obtaining continuous research funding with the explicit purpose of developing methods to predict earthquakes. 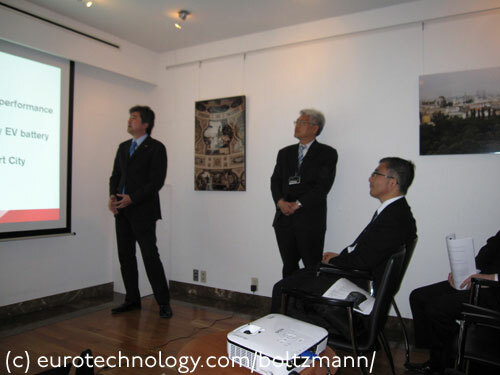 Once this funding started flowing for many years now, it is very difficult for scientists obtaining this funding to put the possibility of earthquake prediction in question. 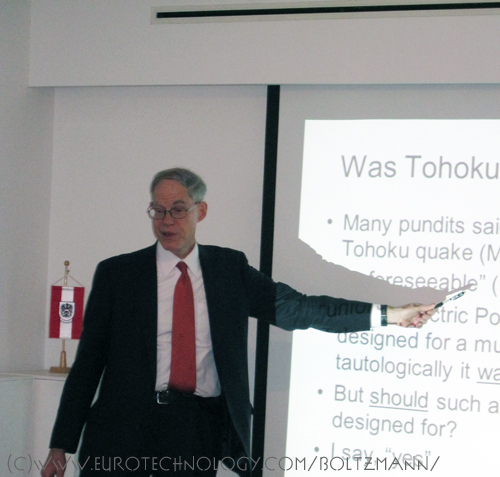 Robert also discussed official earth quake risk maps, and explained that many of the strongest earth quakes occur in areas which are officially designated as low risk areas. 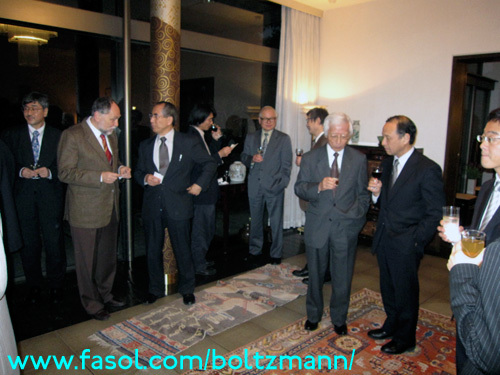 Robert called for a reassessment of earth quake policies and preparations for future disasters, using the most up-to-date results of earth-science, and to review outdated positions, and abandon those positions, which have been shown to be invalid using established methods of physics. 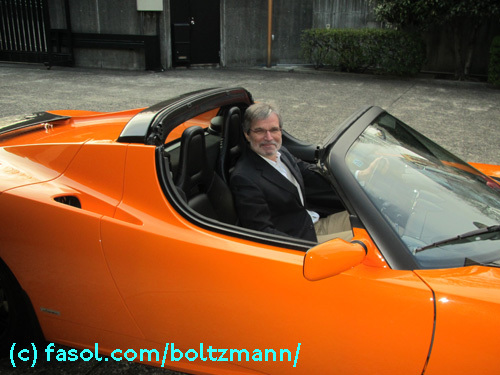 Gerhard Fasol reviewed Ludwig Boltzmann’s life and work, and particular his life-long work on the fundamental laws of physics governing energy. 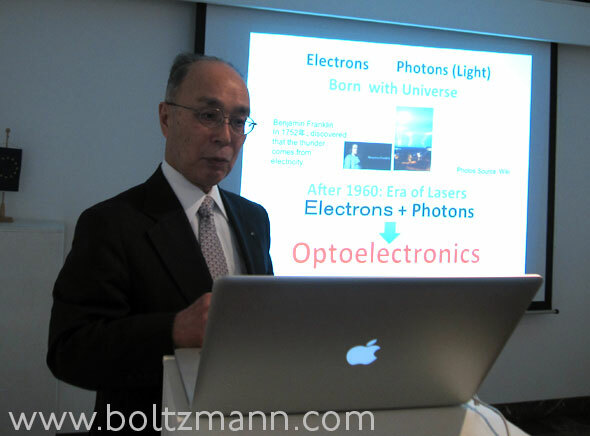 Jonathan Dorfan introduced OIST, The Okinawa Institute of Science and Technology, which has just recently been accredited as a Graduate University by the Japanese Ministry of Education, and introduced several research programs in the field of energy generation. 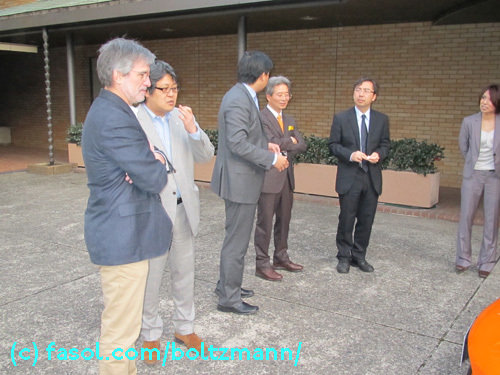 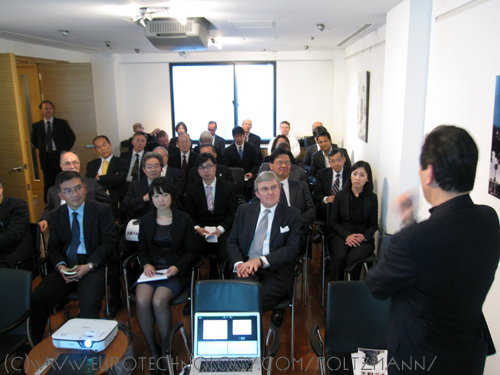 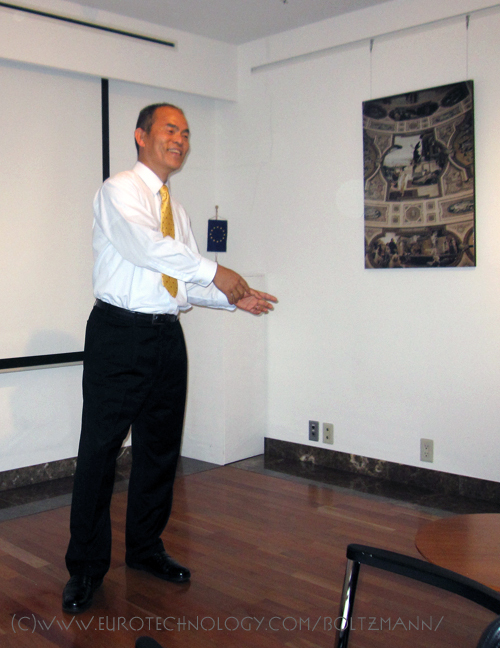 Jonathan explained the history of OIST, and OIST’s pioneering position as an English speaking international Graduate University in Japan. 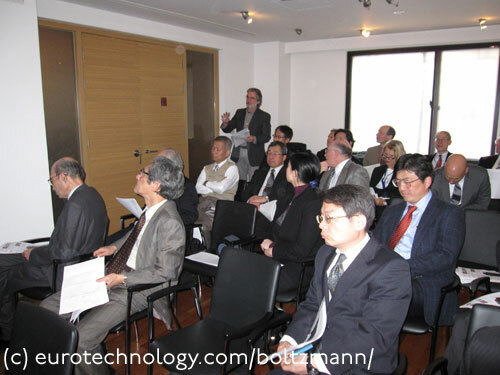 In particular, OIST has no Departments which would create barriers between research groups, instead the emphasis is on cross-disciplinary cooperation supported by the latest instrumentats and research tools. According to Jonathan, OIST succeeds in attracting most outstanding staff and students – surprisingly current market conditions seem to make it easier to attract outstanding research staff than students – the market for attracting outstanding students seems to be more competitive than for research staff. 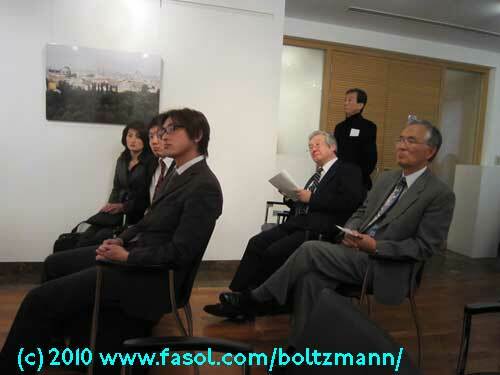 OIST offers scholarships for students, many or all of which are graduates from top ranking undergraduate schools. 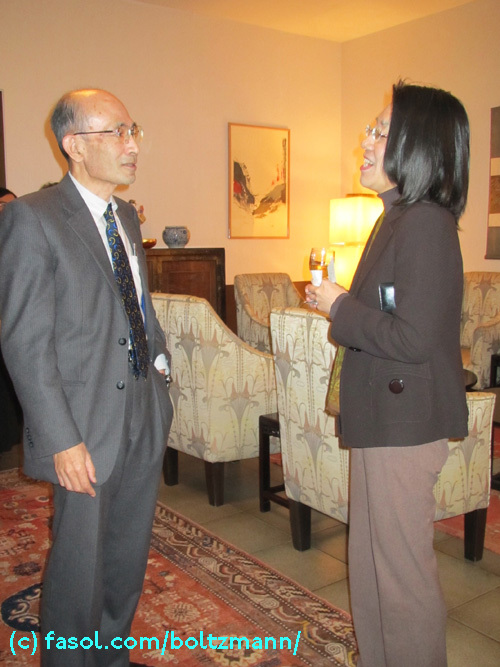 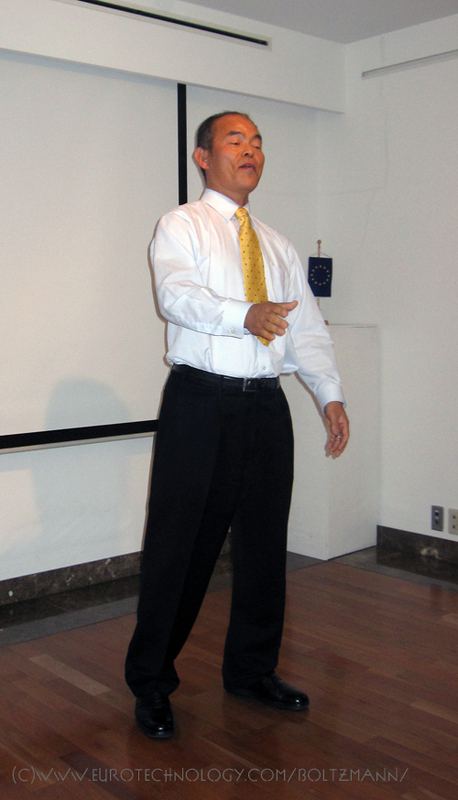 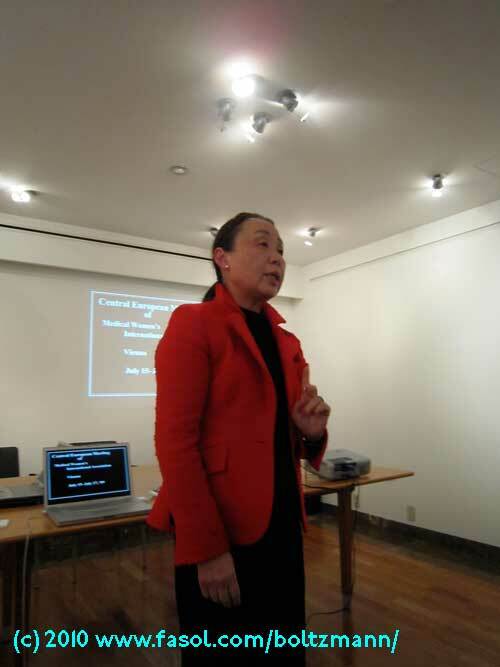 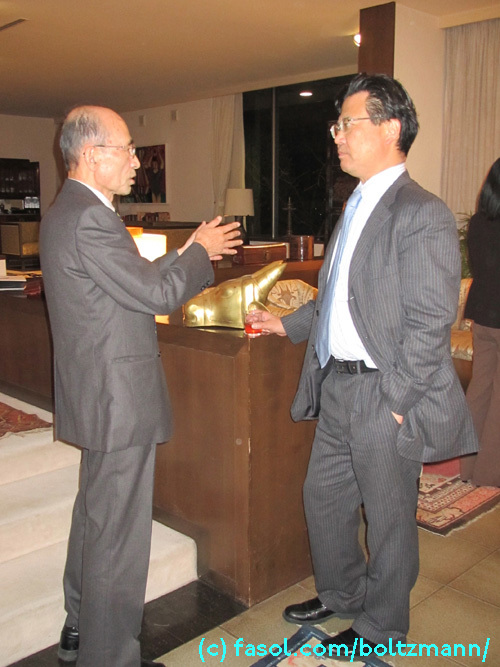 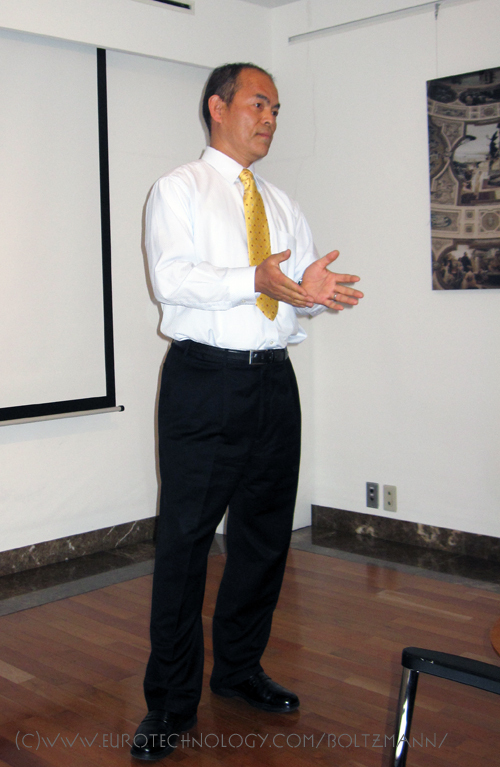 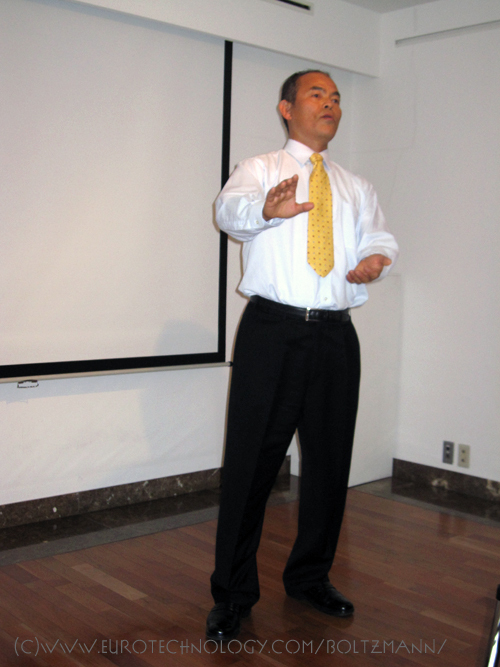 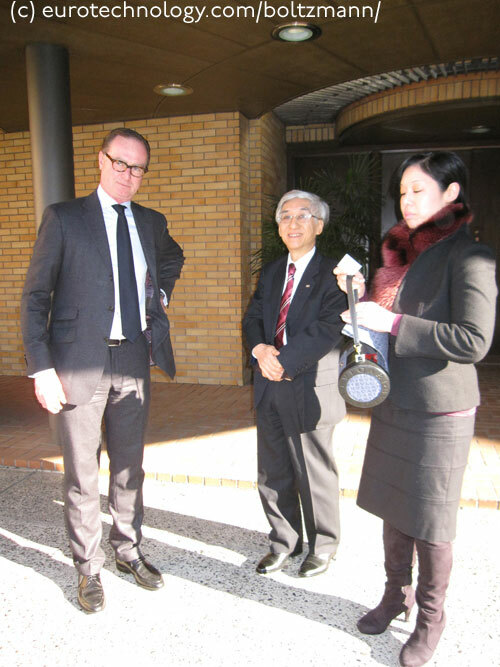 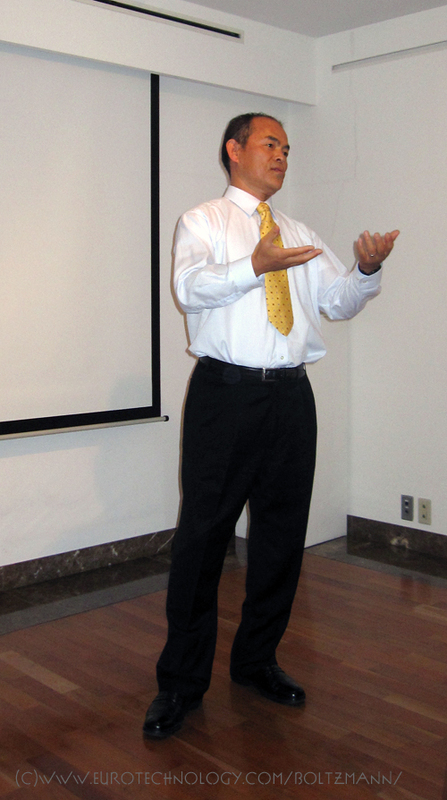 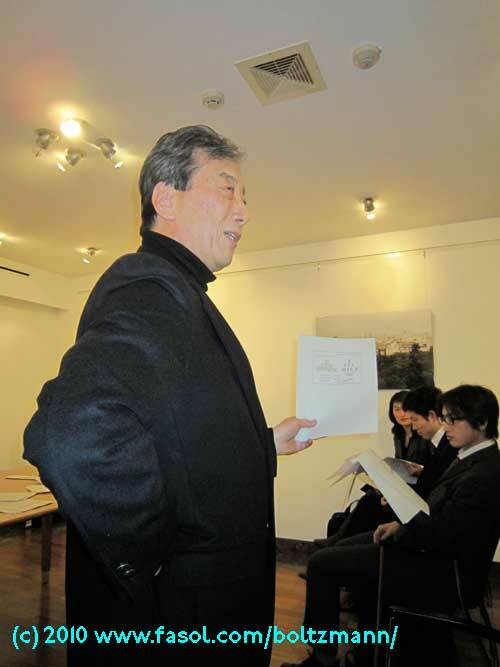 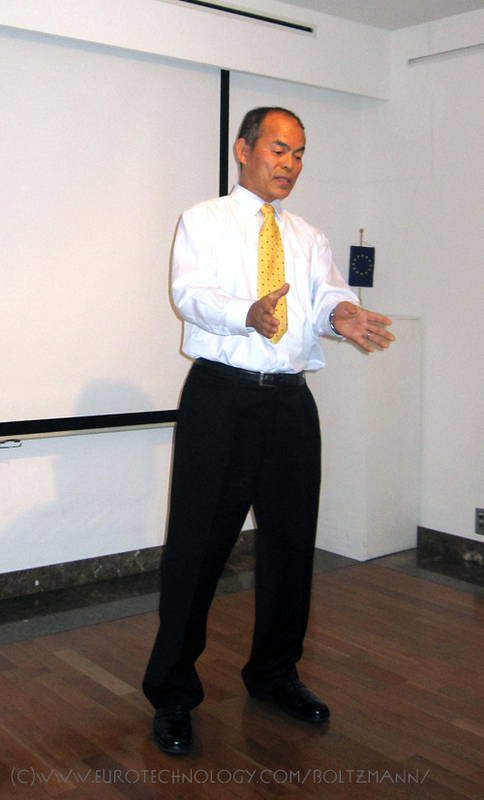 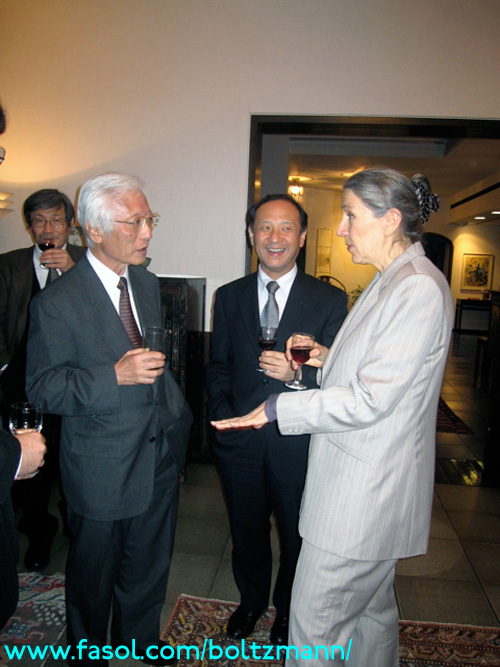 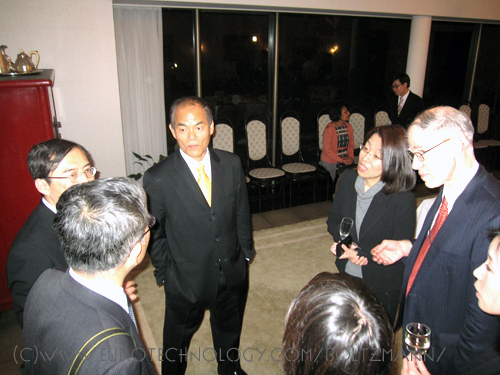 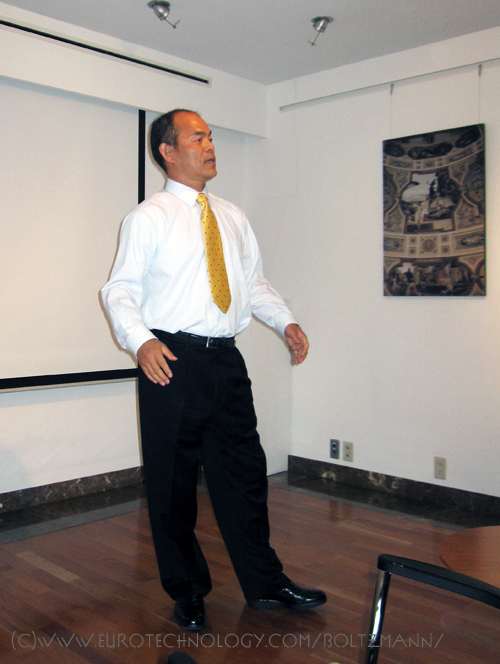 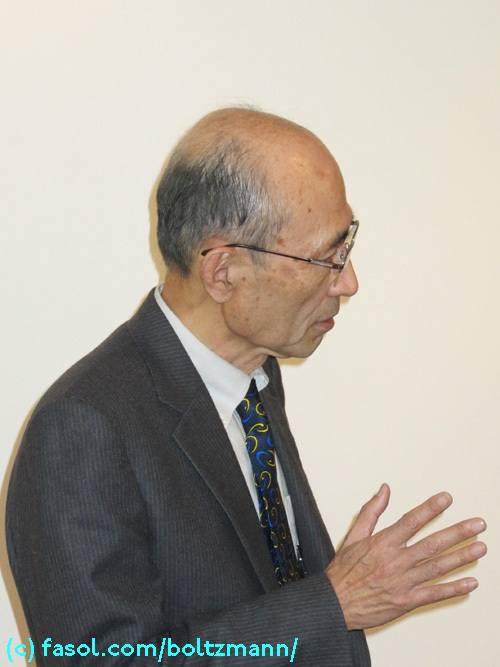 As every year this year’s high-light was Professor Kurokawa’s presentation – Professor Kurokawa gave a passionate plea for change on all fronts – most surprising was his suggestion to select a Muslim Malaisian woman as the next President of Tokyo University, in order to achieve urgently needed changes in Japan’s society and Japan’s Universities. 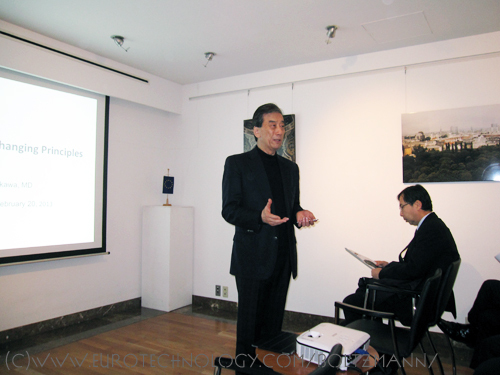 Professor Heshiki explained about ethics and professionalism focusing on medical sciences and the work of medical professionals. 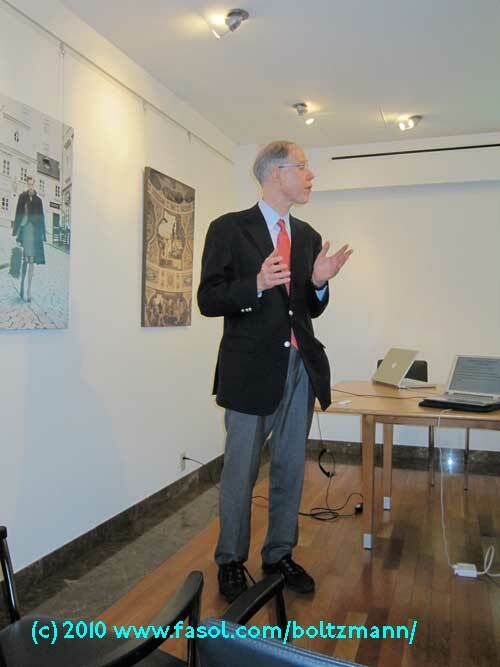 Professor Robert Geller explained how today’s bibliometrics revolution allows much better than in the past to measure the impact of scientific work. 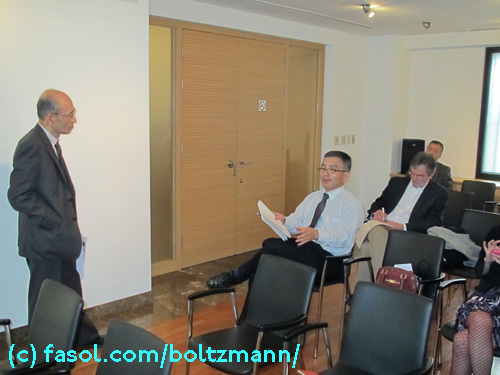 Robert suggested how to use bibliometric data to make the selection, appointments and promotions of researchers and academics more efficient. 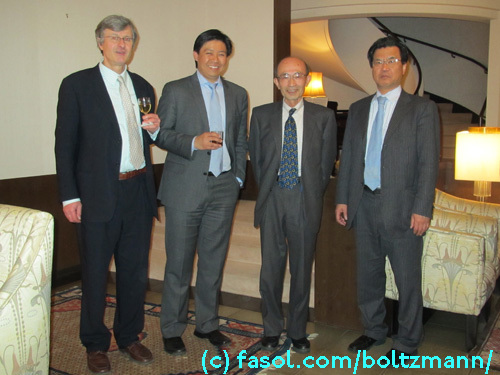 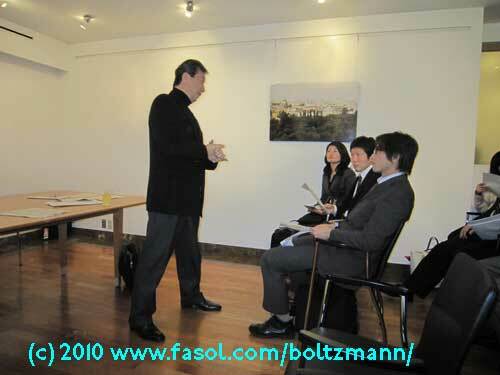 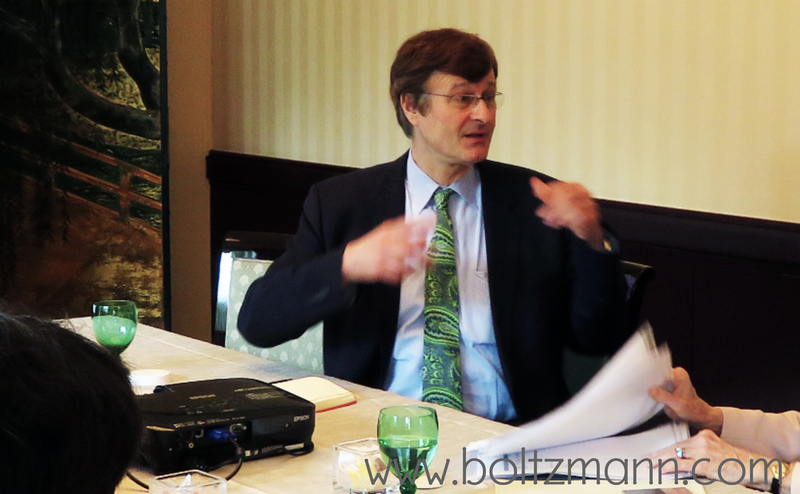 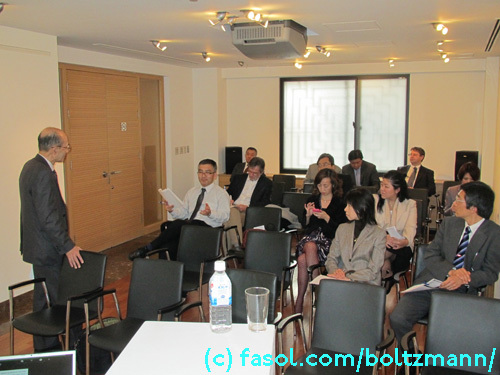 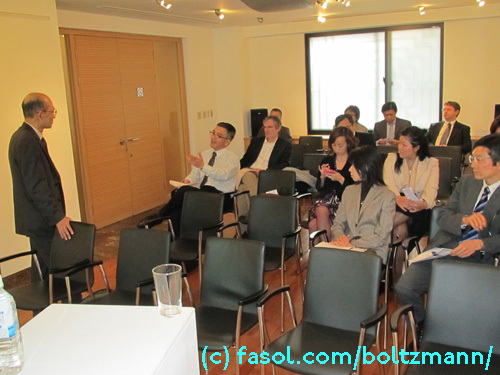 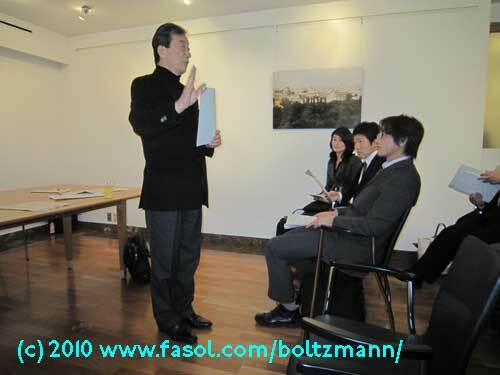 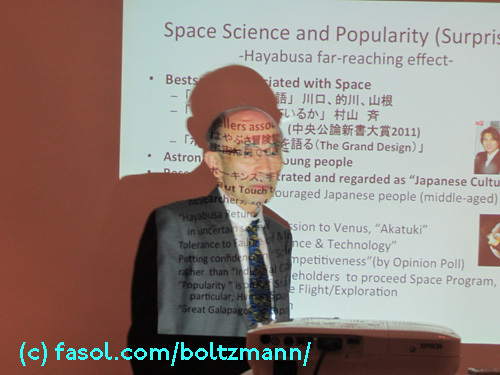 Gerhard Fasol focused on Ludwig Boltzmann’s leadership qualities and his global impact. 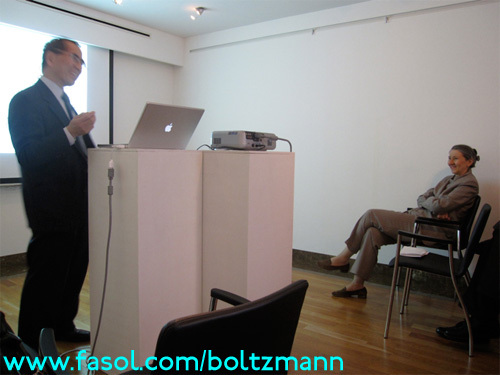 Ludwig Boltzmann travelled three times to the United States of America, and he travelled, and had impact all over Europe. 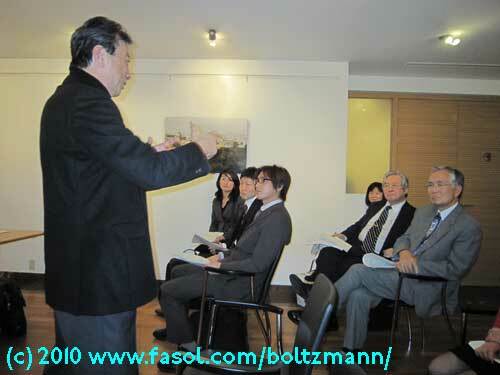 He also worked in several different Universities in Austria and Germany. 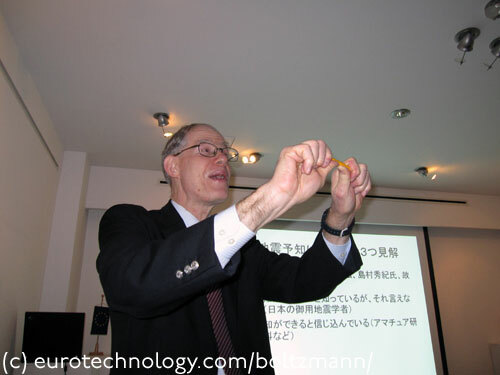 Sherman Fairchild University Professor Emeritus, Princeton University, Executive Advisor, National Institute for Information and Communications Technology (NICT), Japan. 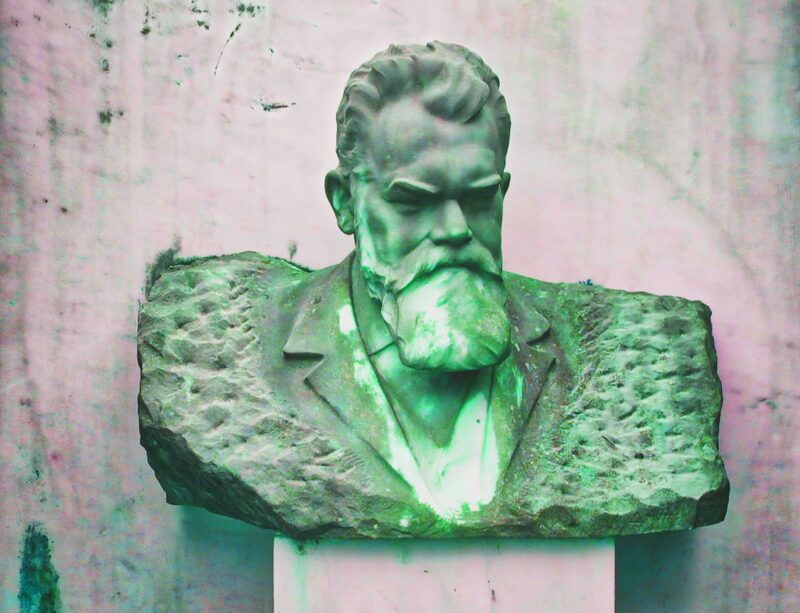 Ludwig Boltzmann was one of the most important physicists and philosophers: it is almost impossible for any engineer, chemist or physicist to do a day’s work without using Boltzmann’s tools and results every day. 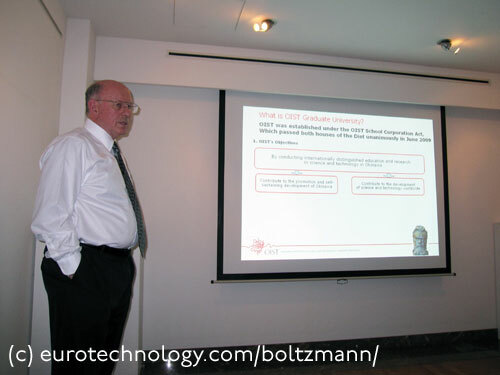 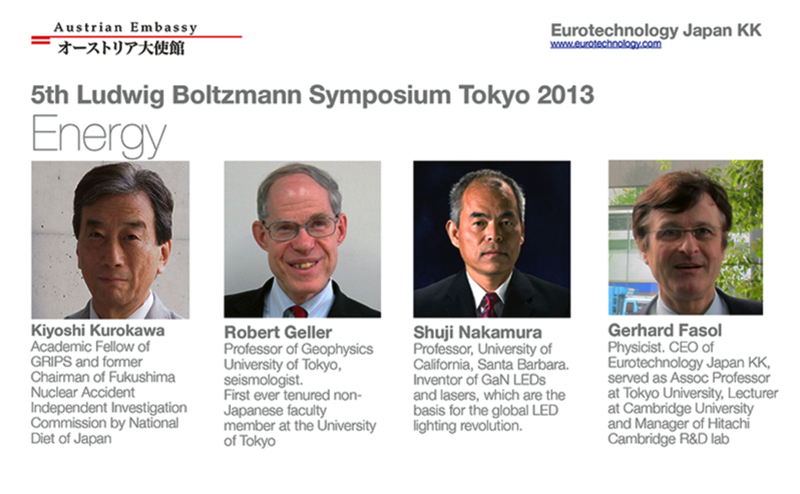 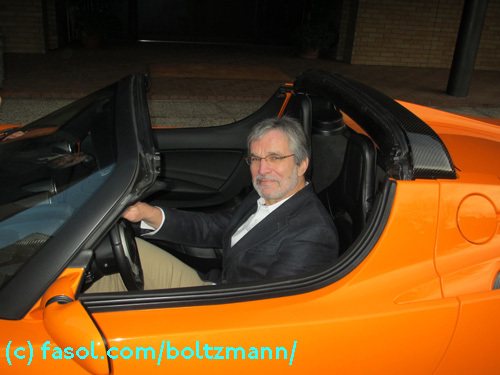 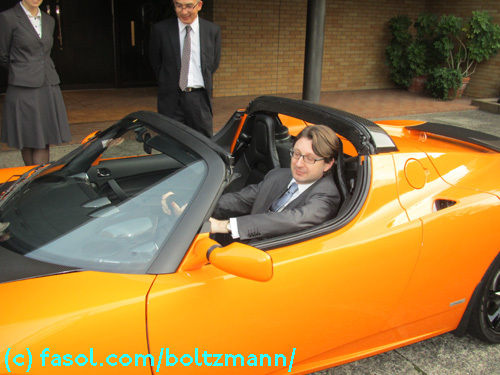 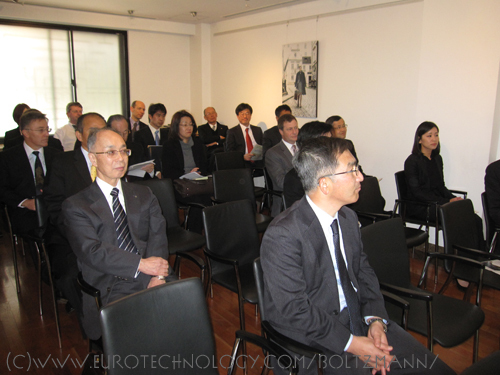 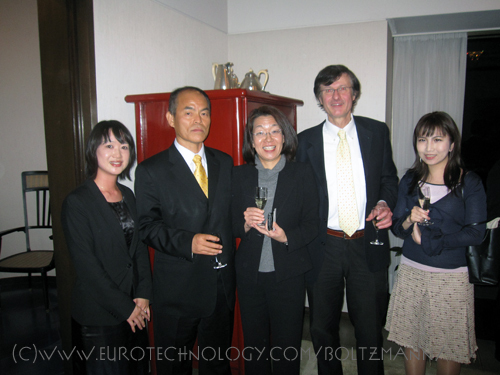 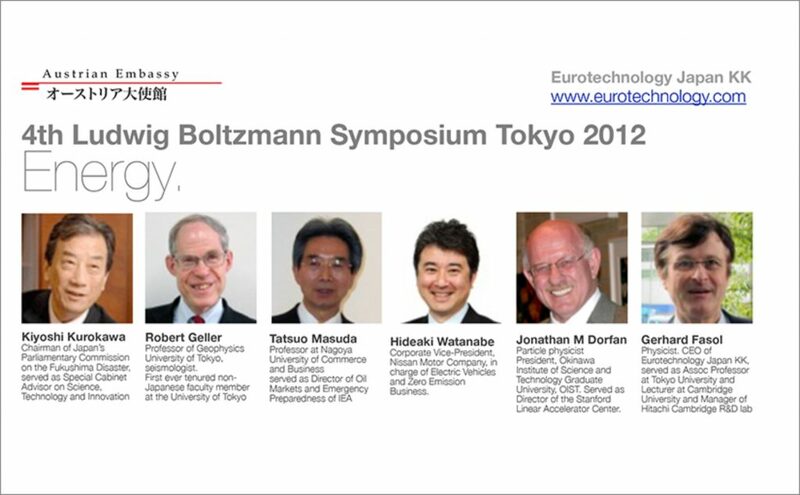 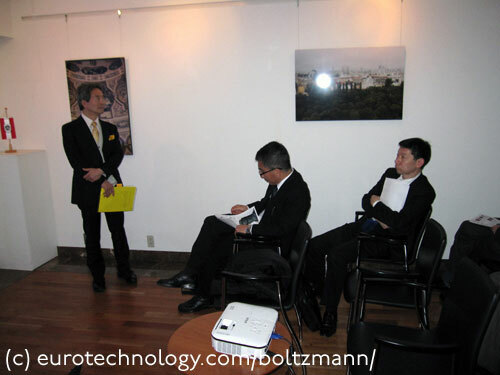 Ludwig Boltzmann is this author’s and Eurotechnology Japan KK’s founder’s great grandfather – and his excellence is our company’s guiding light. 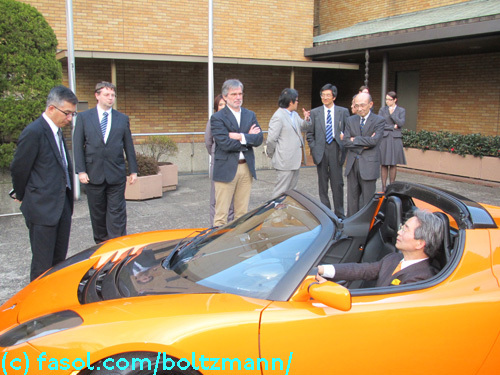 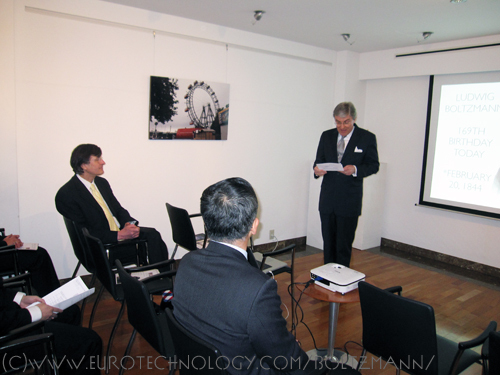 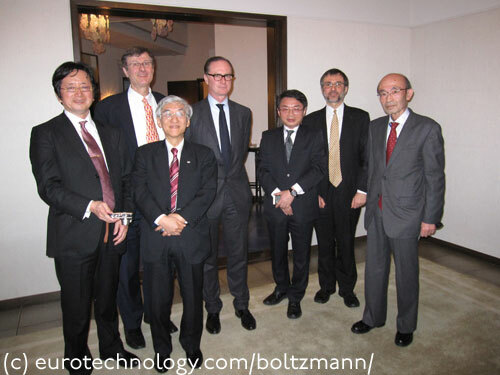 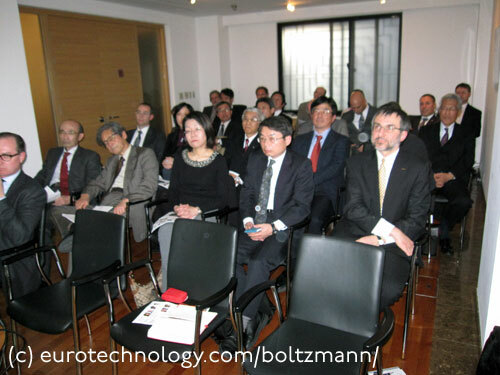 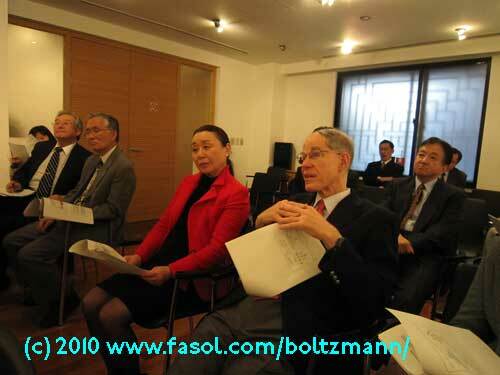 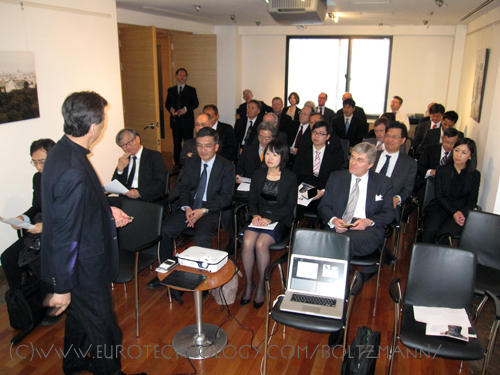 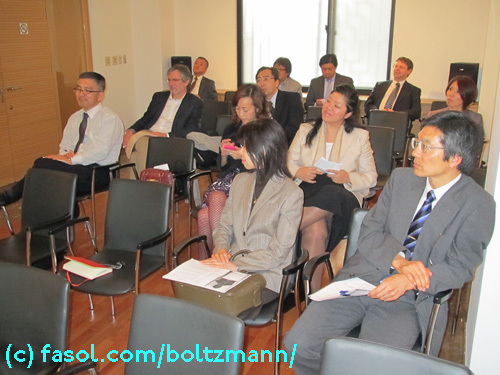 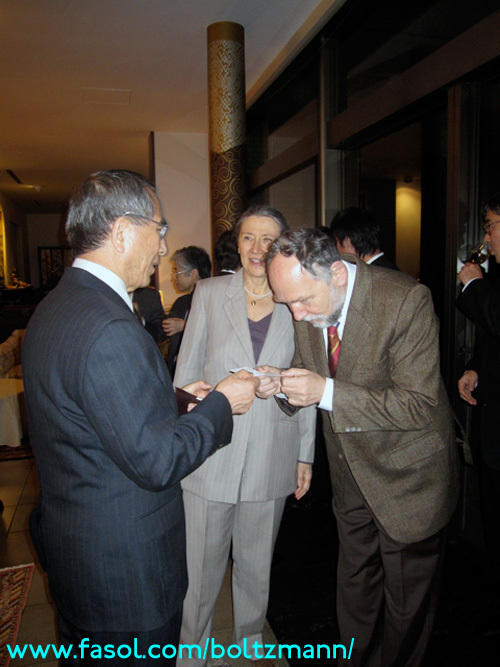 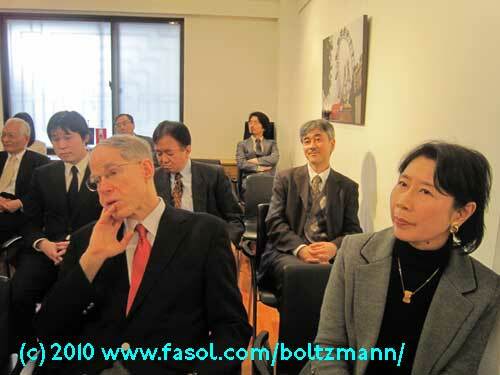 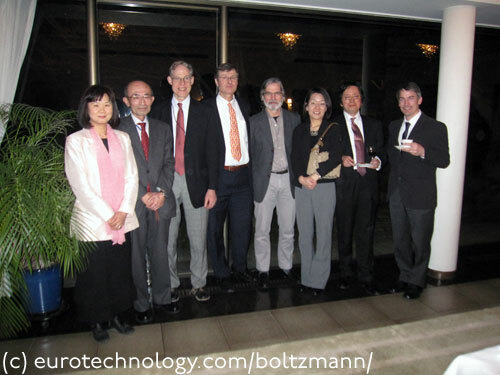 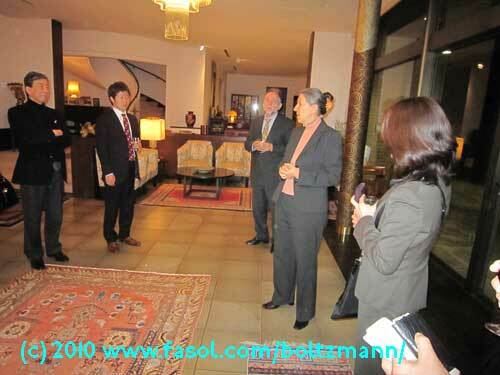 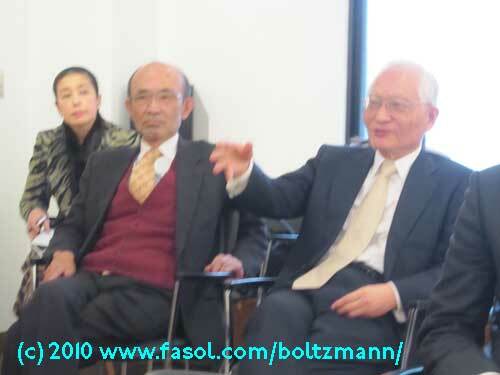 Ludwig Boltzmann was born 165 years ago on February 20, 1844, and last Friday, February 20, 2009 we celebrated by inviting several of Japan’s science and technology leaders to the Ludwig Boltzmann Symposium in Tokyo with kind cooperation and hospitality by the Ambassador of Austria and the Austrian Embassy. 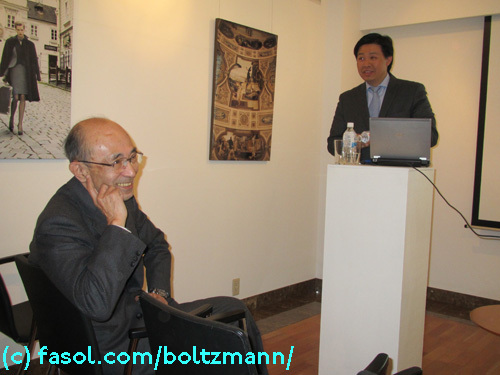 First speaker was Professor Hisashi Kobayashi, Founder of the IBM Tokyo Laboratory, former Dean of Engineering of Princeton University. 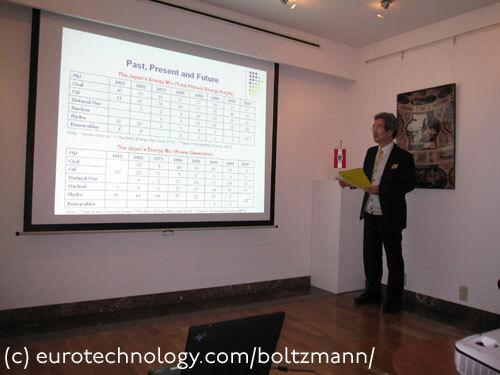 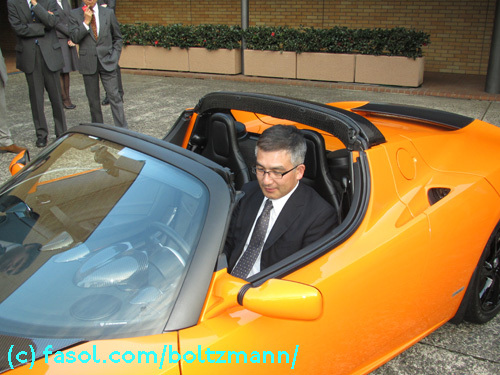 He showed how Entropy and noise in communications is linked to Boltzmann’s generalized Entropy and the H-Theorem. 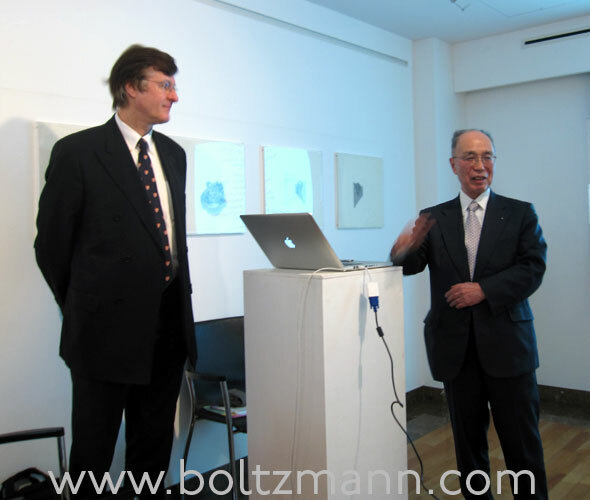 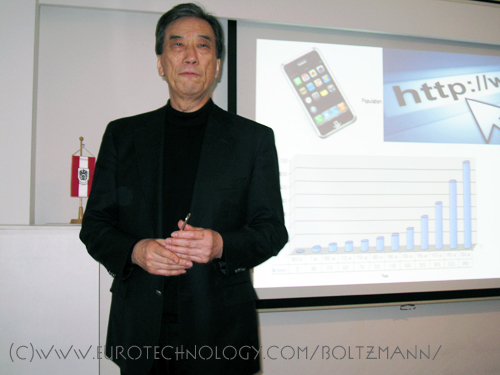 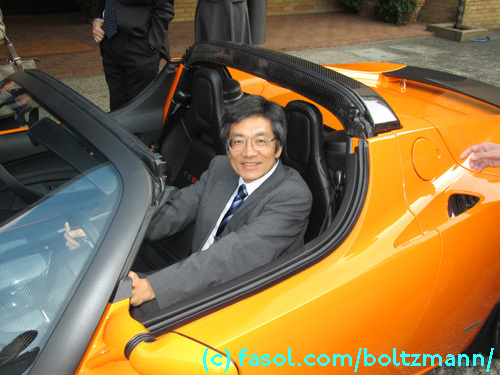 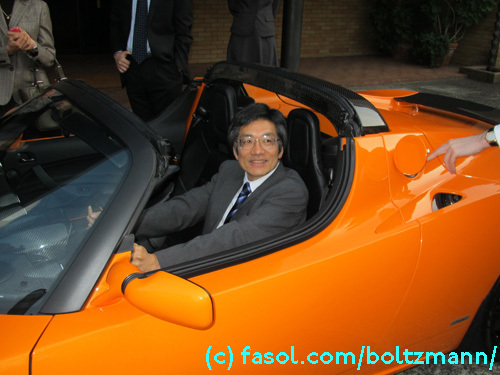 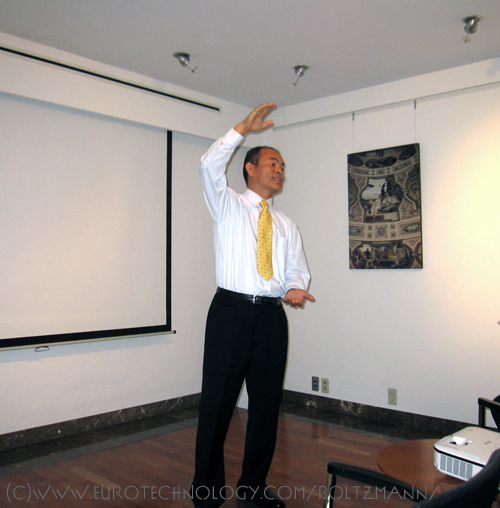 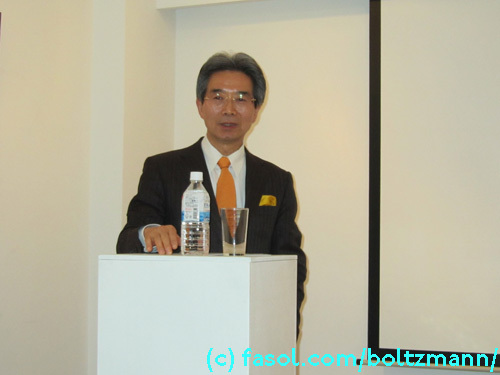 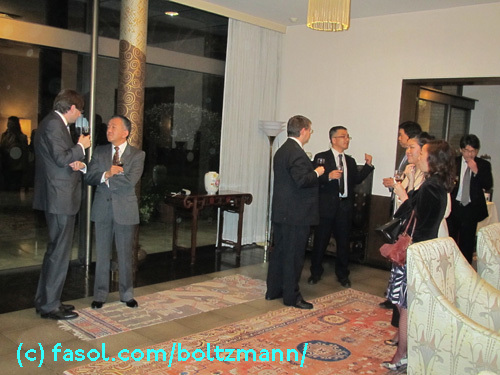 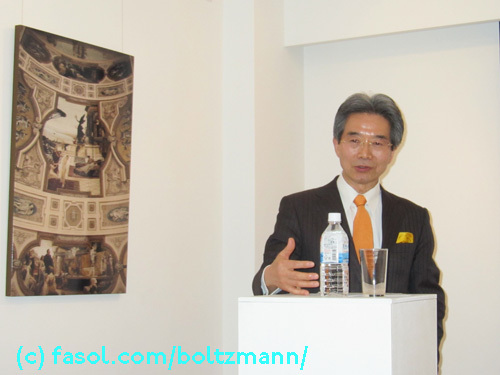 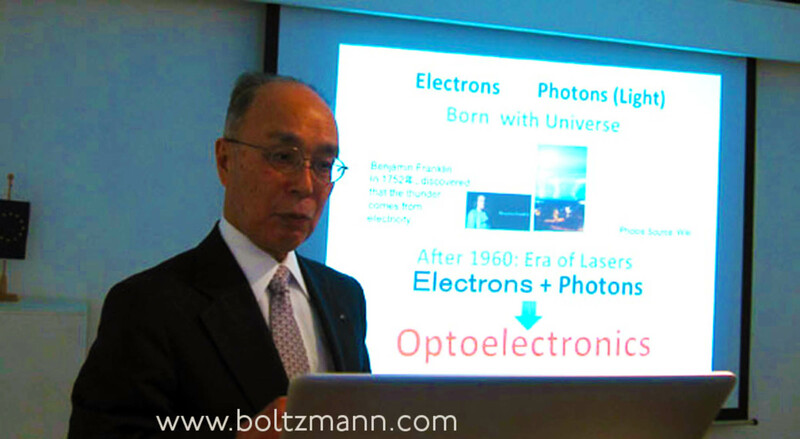 Coming from Princeton, Hisashi also showed us elegantly how strongly Einstein’s work is linked to Boltzmann’s. 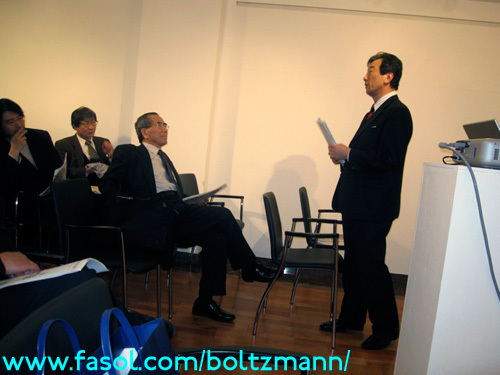 Professor Kiyoshi Kurokawa, former Dean of Medicine of Tokai University, former President of Japan’s Science Council and Advisor to two Japanese Prime Ministers and now Professor at Japan’s new Political Science University, gave an intense and passionate speech about which changes are necessary to live in our future which will be hot (as in global warming), flat (as in global communications and internet) and crowded (due do population growth). 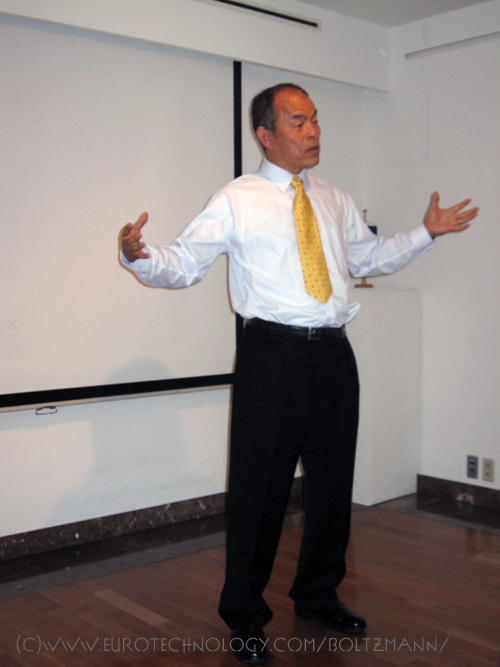 (Website of the book “Hot, flat and croweded” by Thomas L Friedman) Kiyoshi also made a passionate appeal to Japanese organisations (including the S&T leaders participating at our Symposium) to change, open up and compete globally. 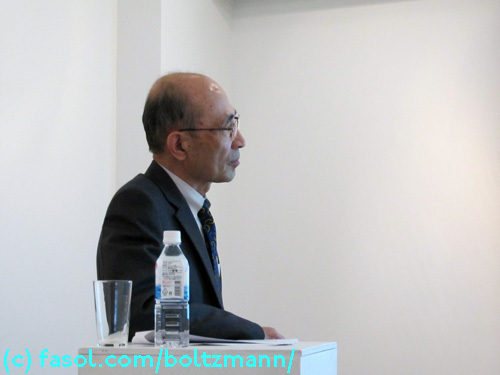 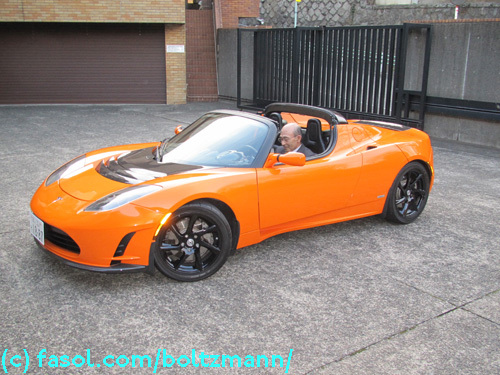 Kazu Ishikawa of Exa Japan gave a fantastic demonstration how Boltzmann’s equations are used to simulate airflow for the construction of cars, airplanes, jet engines … Boltzmann’s equations replace the macroscopic Navier-Stokes equations as numerical wind tunnels. 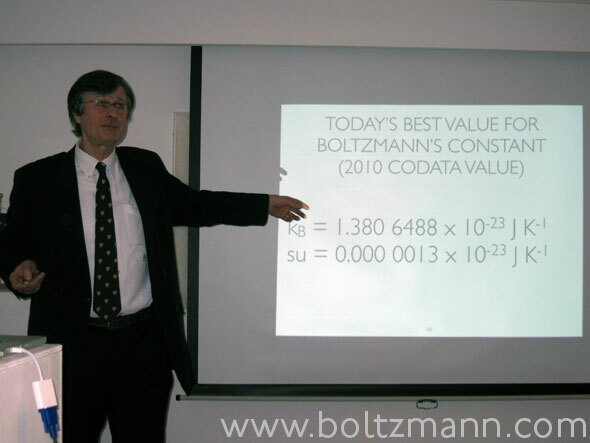 Boltzmann’s equations are particularly needed for the simulation of transients. 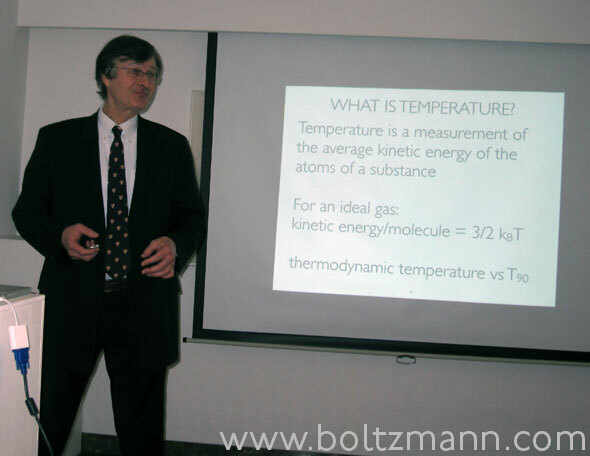 Finally, Gerhard Fasol, Ludwig Boltzmann’s Great-Grandson, gave two talks: one talk about Ludwig Boltzmann’s scientific achievements, his search for understanding the 2nd Law of Thermodynamics with mechanics, the effects of collisions and the generalization to non-equilibrium – leading the H-Theorem, and the generalization of Entropy and Boltzmann’s philosophical work. 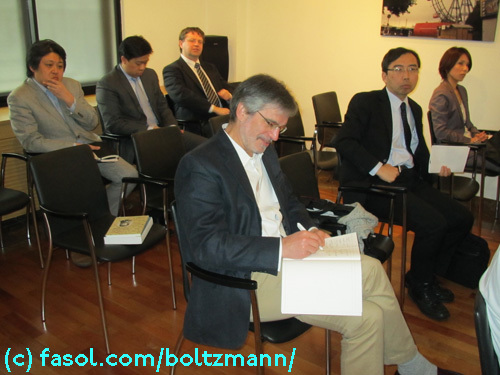 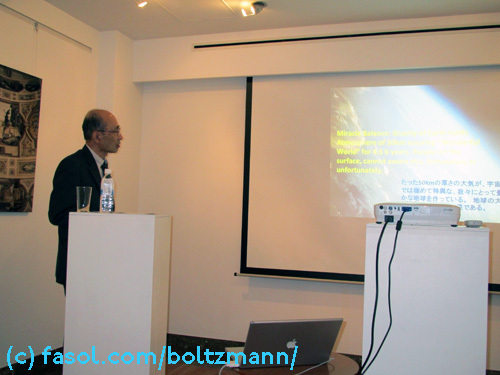 The second talk introduced the human side of Ludwig Boltzmann: his life and his passions.